I've long enjoyed urban art, but lately, I feel like it's become a bit of an obsession - or maybe "passion" is a more positive word for it. I want to find all the street art I can - & I love that more & more of it seems to be going up throughout the city. 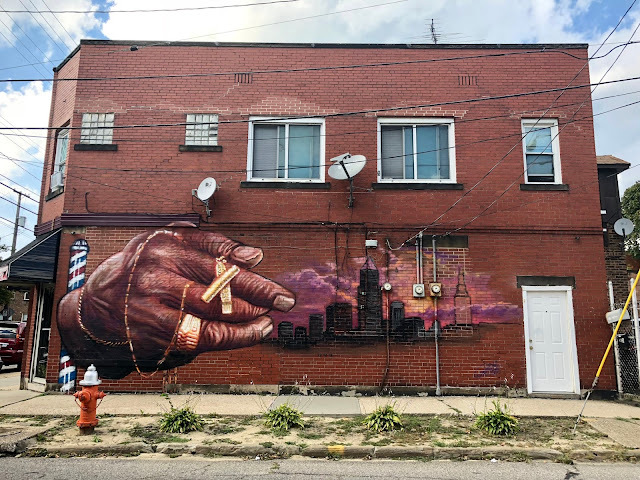 I recently started a new Instagram account, @clestreetart, to chronicle my love of murals & to share them with other Clevelanders & anyone else who appreciates art. 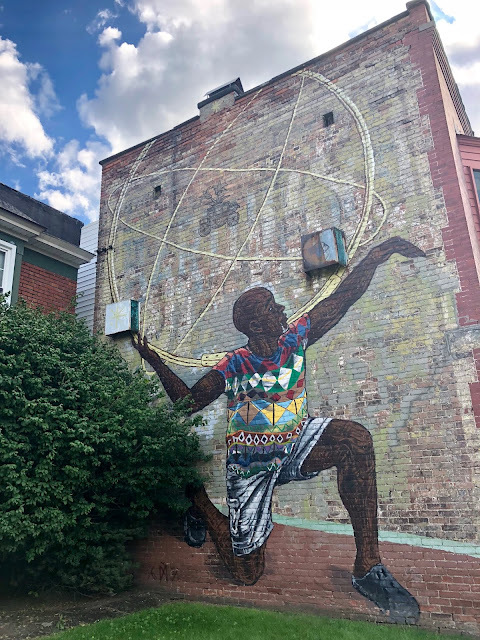 I started with images I already had in my phone, mostly taken of murals throughout Tremont (where I live) & Ohio City, the next neighborhood over. 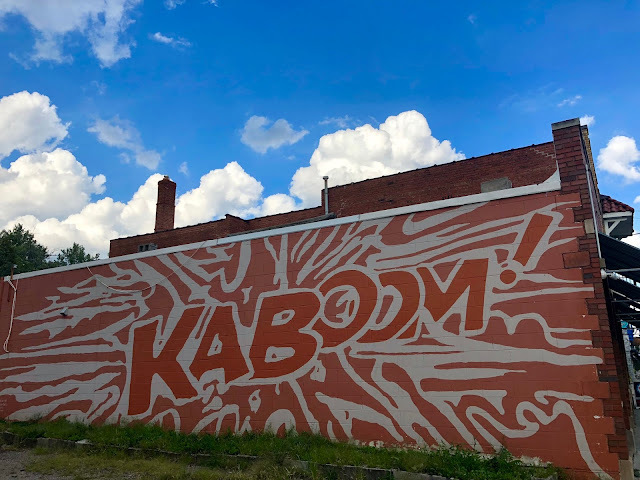 Recently, with Mike away on a business trip, I decided to take a solo day to explore Waterloo Arts District, which is easily Cleveland's most art-heavy neighborhood (at least when it comes to commissioned works). It's about a 15-minute drive from me, but I don't often make it out that way, so I loved being able to explore this new-to-me neighborhood on a sunny day. 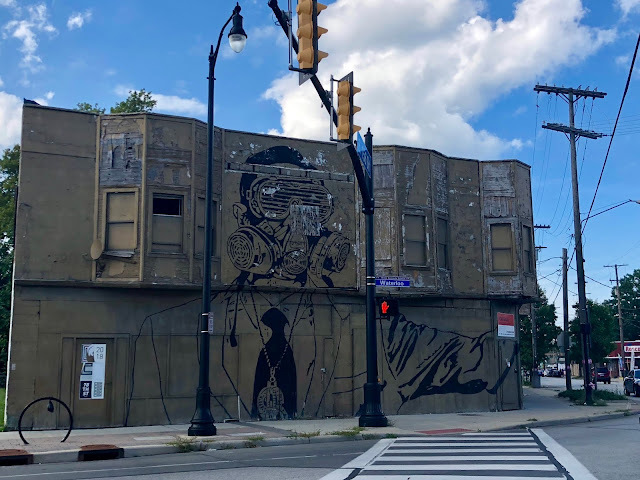 Many of Collinwood's murals were painted in 2015 as part of the Zoetic Walls project, which was the city's first organized street mural effort, resulting in six murals. 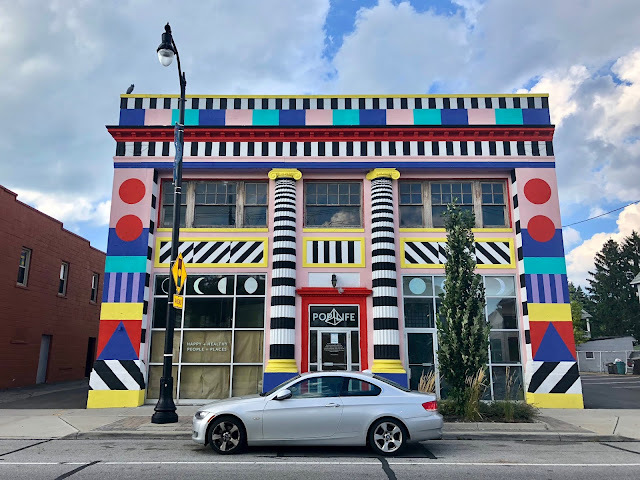 The mural one you see above, painted by Cleveland artist Lynnea Holland-Weiss, came from that project & was inspired, in part, by the artwork of the weaver who owns the building. 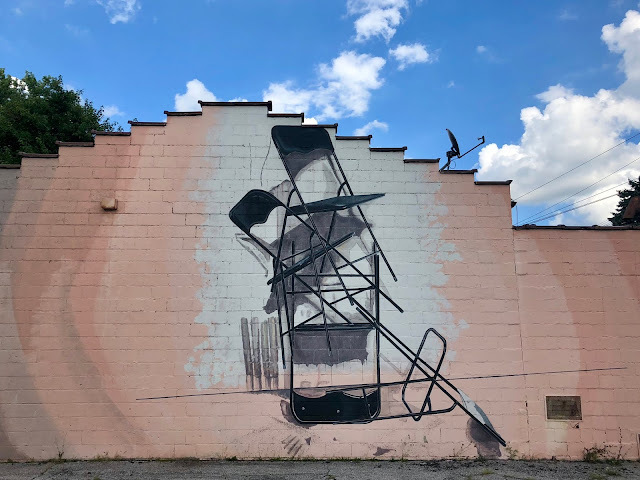 Attached to Holland-Weiss's mural is a separate mural, also part of the Zoetic Walls project, on the front of the CJ Industrial Supply building. This one was painted by another Clevelander, Dan Isaac Bortz. 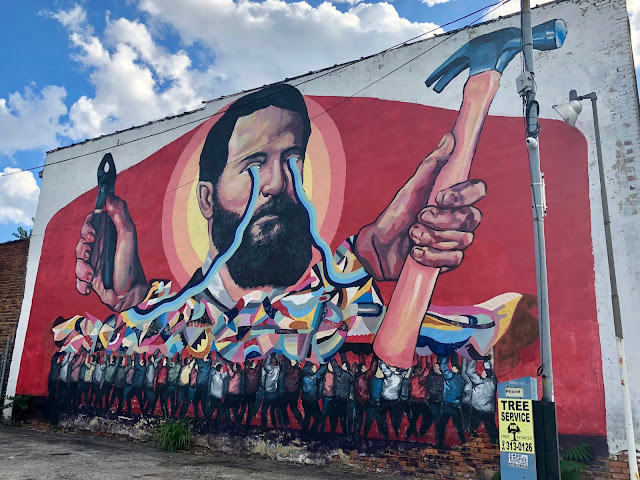 I love how the two murals bump up against one another like one piece, though they're completely different & clearly created by different artists. 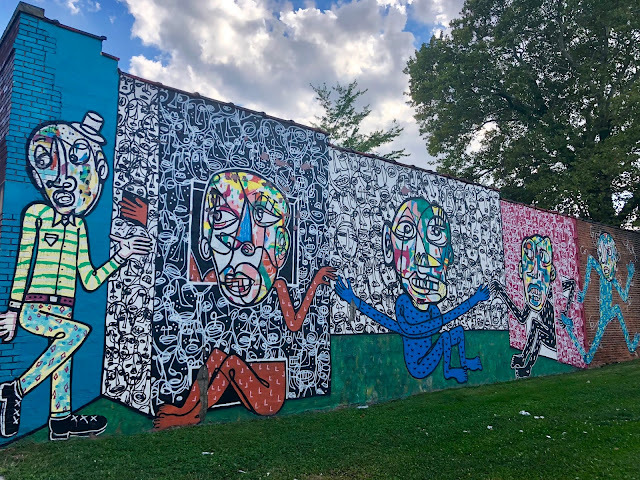 This beautifully chaotic piece, featuring dozens of line-drawn faces, appears nearby, at East 156th St. & Waterloo, done by the anonymous Brooklyn artist RAE. Unfortunately, as you can sort of see in this photo, parts of the wall - & thus, of this piece of art - have now flaked off in large chunks. 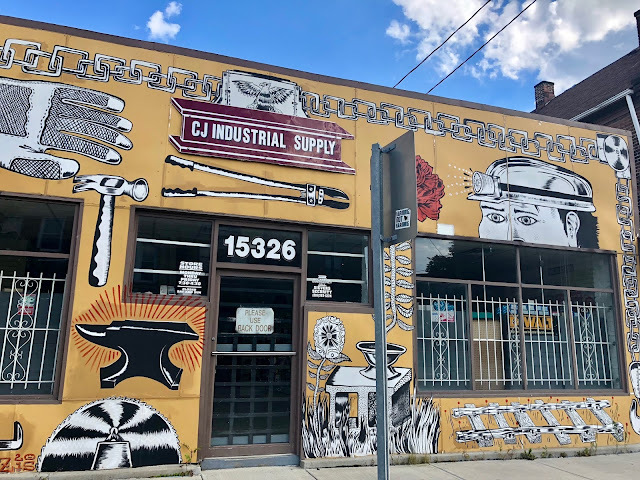 Also at Waterloo & East 156th is this beautiful, industrial-looking piece, painted in 2013 by Baltimore artist Gaia; based on his website, it appears to be titled "Industrial Sunset/Creative Placemaking." 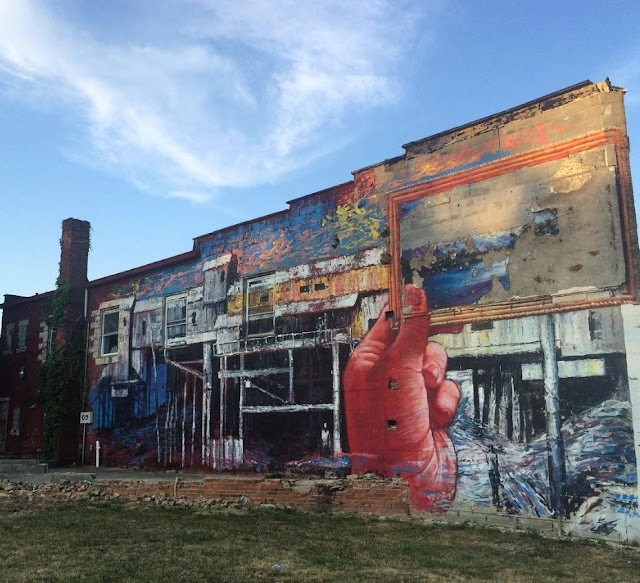 This mural is really cool, but Gaia's other works are also pretty incredible. I'd love to see Cleveland score one of his flowered murals! This building has a weird, creepy vibe to me, & not just because the building is dilapidated. 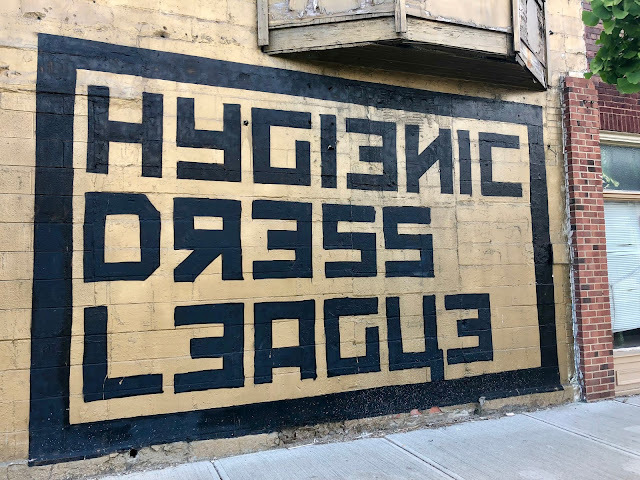 This one was done by Hygienic Dress League (whose logo is around the side of the building, seen in the second & third photos below), described as "a duo who fights crime and corruption in the fair city of Detroit." If you look closely at the image of the man on the front of the building, you'll see that he's wearing a face mask, Bain-style. This seems to be their standard style of painting - lots of them include the same face mask - but they're also now into, like, gold-painted birds & animals, which I kinda want for my yard. Annnnd another one at Waterloo & East 156th (yes, these are all very close together) is this piece on the side of the Slovenian Workmen's Home building. Painted by Argentinian artist Ever, it's called "Description of the Union Workers," which is... well, kind of heartbreaking. 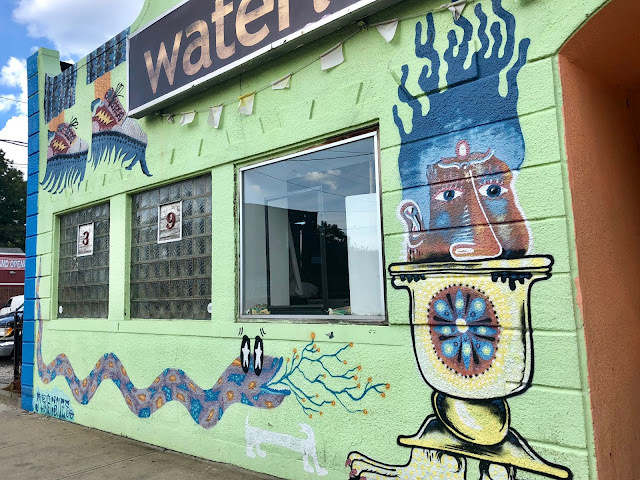 Around the corner from these pieces, you'll find the Waterloo Arts building, which houses the organization dedicated to arts revival in the neighborhood. The history is sort of fascinating, actually: The area, which was originally called Collinwood, was in a terrible state of decline around 2002, & this organization was one of the ones that helped bring about its revival. 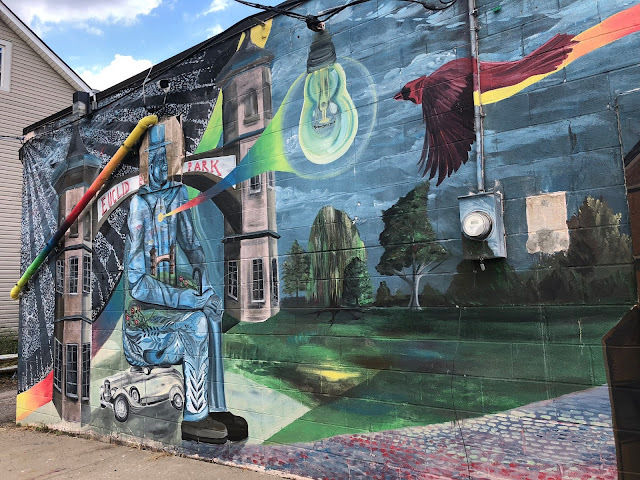 As you can see, lots of the buildings in the Waterloo Arts District are abandoned or rundown, & I certainly wouldn't say the neighborhood itself is, well, revived - but the art makes it feel particularly vibrant & intimate. Unfortunately, I couldn't find any information about the artwork on the building itself, but it's pretty cool to look at. This is the mural on the other side of the Waterloo Arts building, with a description of the work & those who helped create it in 2010. 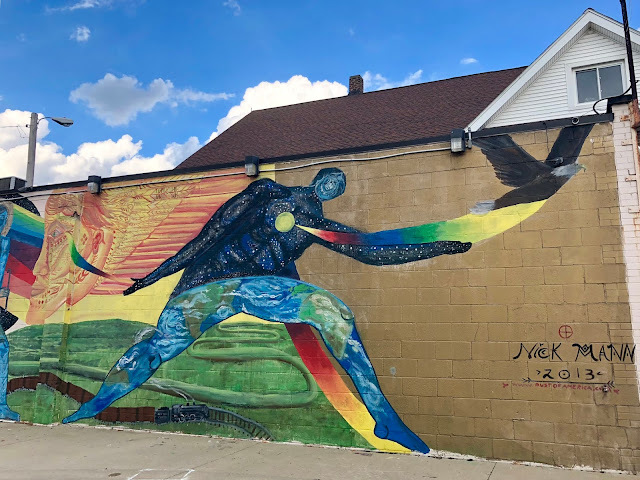 It reads, "This mural represents our vibrant community and shows what can occur when established artists collaborate with students." 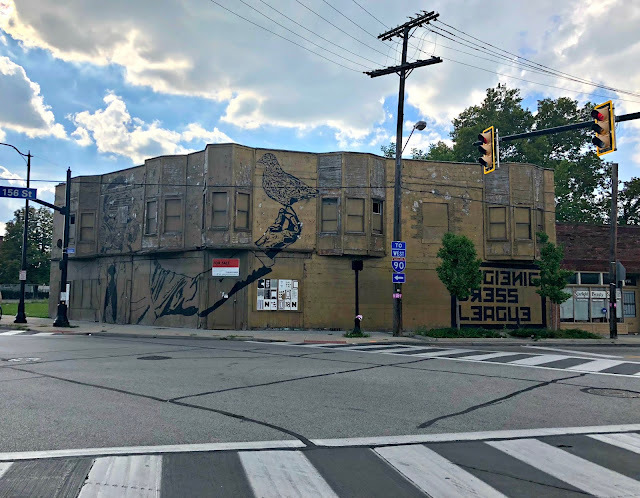 Annnnd here's another mural from the Zoetic Walls project, this one painted by Cleveland artist Bob Peck. These splashy, brightly colored pieces seem to be his specialty. What a shame that someone has defaced this Zoetic Walls piece by Kyle Nielsen. I think it says "LIT," but I can't find a single thing about it online. 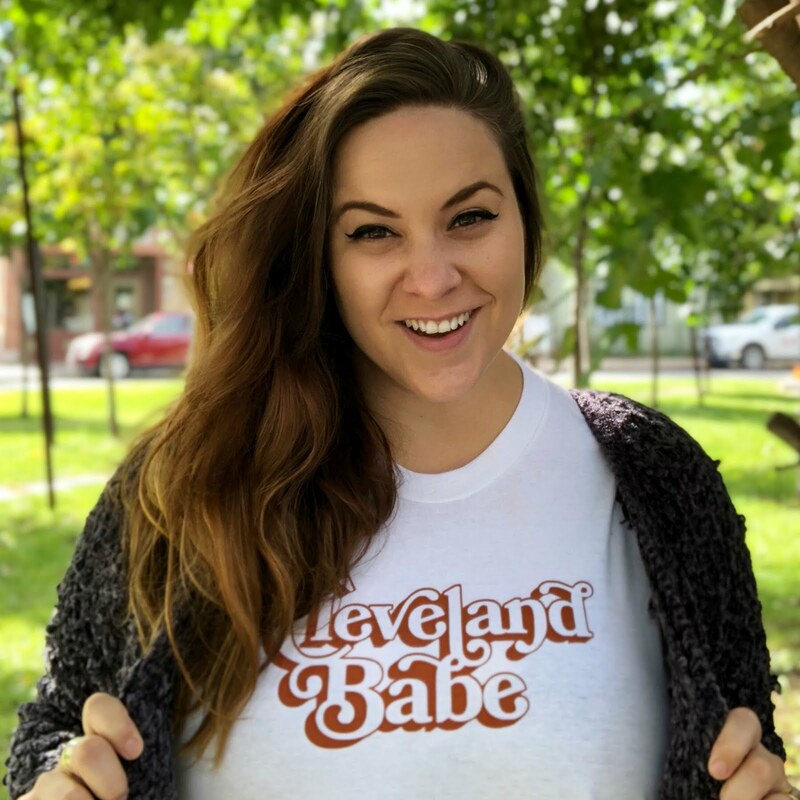 Any fellow Clevelanders know anything about it? That is one seriously pink building. 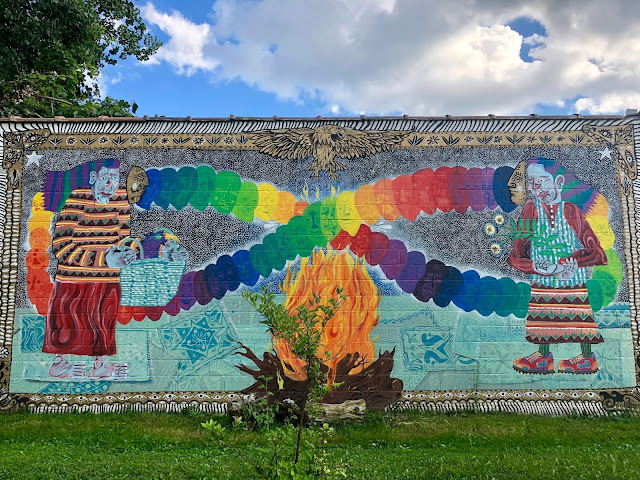 I wasn't able to fully photograph this mural, another one from Zoetic Walls, because it's on one side of someone's driveway &, well, there was a car in that driveway (as you can see) - but it's obvious it's really cool. It was painted by Canton artist Steve Ehret, who describes himself as "The Man Behind the Monsters." Seems appropriate! 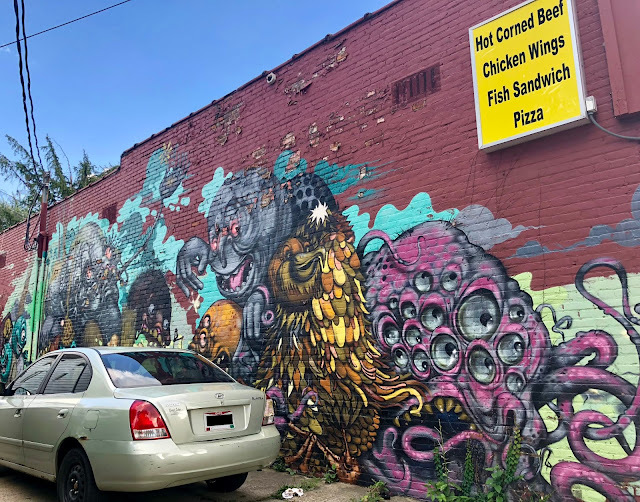 The next two photos are actually of the same mural, a long piece that covers the back of a wall connecting a few different businesses - & again, there were cars parked in the way, so I couldn't fully photograph it. This one, which you'll find at East 161st and Waterloo, was done by California artist Nick Mann, a.k.a. Doodles, a.k.a. Nikos Manopolous, a.k.a. @dustofamerica. (Dude's online presence is real hard to figure out.) It's called "A Prayer for Collinwood," & you can see the whole thing on his Facebook page. Brooklyn artist Gabriel Specter painted this mural on the side of St. John's Lodge. Yes, it's a pile of folding chairs, & no, I cannot find anything about it online that would explain why he chose this imagery. But it's kind of cool, right? I like the way he painted it in an ombre, especially given the way the building is shaped - with that stair-step roof. 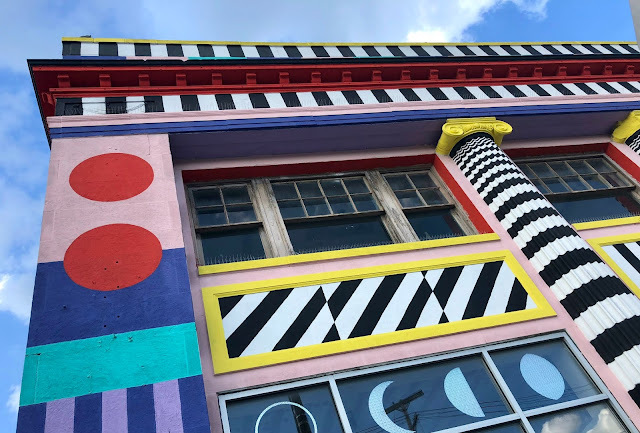 London artist Camille Walala transformed an old Key Bank building into this truly stunning work of art, painted on all sides, now known as the Pop Life building. 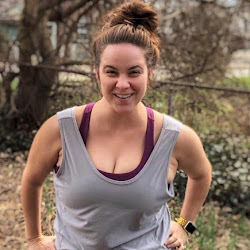 I can't tell whether its open yet, but The Plain Dealer reports that it's to become a yoga studio & juice bar. It looks like they ran a class in July, but there's nothing else on their schedule, so I'm not sure what's up. If the inside is anything like the outside, though, I'm gonna need to check it out immediately. Kaboom! I couldn't find much online about this piece, except that it seems to have been painted in 2009 as part of a project called Waterloo Walls that may or may not have gone any further. If a random blog is to be trusted (& I mean, that's where I'm writing, isn't it? ), the artist of this piece was Christopher Diehl. I was about to leave Collinwood but first decided to drive around the neighborhood to see if I could find anything else. A little further out, I found this mural painted on the side of a barbershop by Baltimore's Gaia. I only photographed one side, but it surrounds the building. 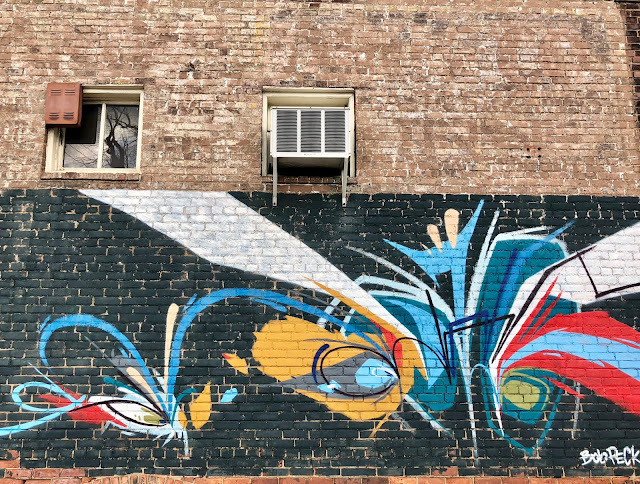 Just around the corner from that one, I spotted two more, including this one from Lynnea Holland-Weiss, which might be my favorite of the day (aside from the Pop Life building, which stands alone). it seems to just be painted on the side of a very small abandoned building? Whatever, I love it. 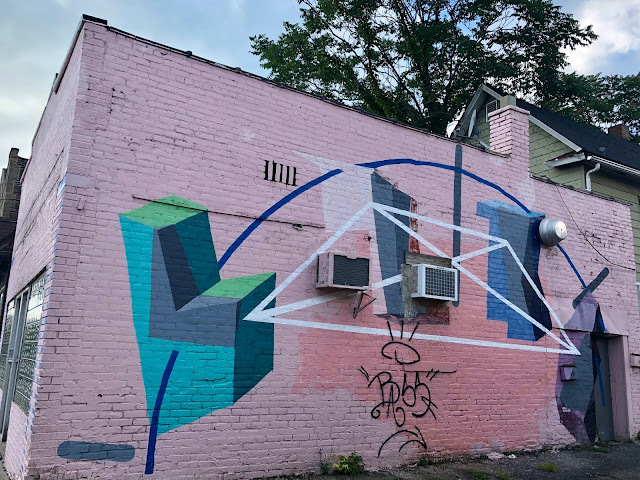 And finally, the second mural by Dan Isaac Bortz, found on the side of an auto repair shop adjacent overlooking a pocket park. The day I came by, there was a church festival happening just around the corner, all loud music & laughter in the background. It felt like a pretty perfect afternoon. After all of this, I discovered that there's a map of all the Zoetic Walls pieces - & that I missed some of them while on my solo trip. Still, I did a pretty good job of spotting most of them, plus a couple extra, & I'll be back soon to catch the ones that didn't make the first cut. 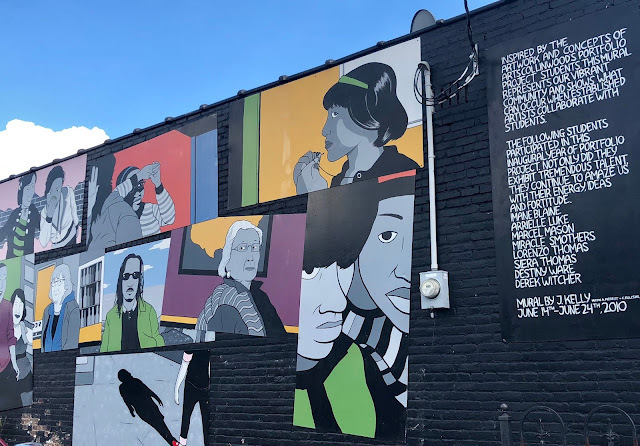 I may or may not chronicle some of my other mural adventures here on the blog (Ohio City & Gordon Square are full of great ones, & it looks like Slavic Village might be, too), but Waterloo Arts seemed like the appropriate place for the debut of my newfound hobby. What do you think? Do you want to see more? In the meantime, follow along on @clestreetart for more art photos from me. Enjoy!